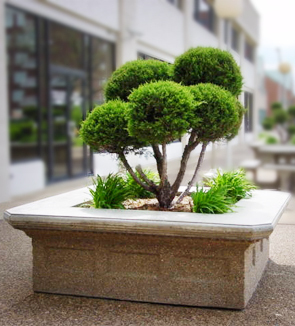 These square concrete planters are ideal for planting large shrubs or small trees in downtown areas or city squares. The large size and heavy-duty concrete construction make them great security barriers, and the wide rim around the edges provide convenient seating on all four sides of the planter. The geometric detailing around the base of the planters also complements city buildings and other architectural elements. Concrete planters are useful when needing to contain root systems of larger plants that may split less durable planters. They can support much more weight than resin and plastic planters, and they surpass any industry standard on strength and durability. Planters are bottomless. Available color options and finishes shown below.